Your mind is an untapped source of amazing power. If you change your mind, you must change your life. Hypnosis has now become widely recognised as the smartest and easiest method we can employ to change our life. Dr Rick Collingwood Ph. D. has practiced and taught hypnosis professionally in Austrailia for many years. Developing a unique and effective hypnosis style, Dr Rick is acknowledged and respected as one of the leading clinical hypnotists and hypnosis trainers in Australia. Helping thousands of people dramatically improve their quality of life, wiht his ability to hypnotise and offer highly effective programming during trance. These recordings have been tested and actually work to the same degree or in some cases even better than professional hypnotherapy sessions. Weight Loss and Appetite Control, will change your inner mind to help you change your eating habits and cravings. 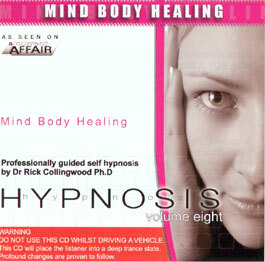 All CDs feature the latest scientific audio technology, Dr. Collingwood's clinical techniques in advanced trance hypnotherapy plus positive subliminal messages.All ten CDs are 60 minute clinical sessions of hypnotherapy recorded with Dr Rick Collingwood Ph.D. It's safe and effortless and can be conducted in the privacy of your own home. Level 1 - Spoken Voice - To induce hypnosis and re-educate the subconscious mind. Level 2 - Constant F Sharp - Deep trance inducing frequencies. Level 3 - Subliminal Impulses - Subliminal messages program from proven maximum effectiveness. Level 4 - Theta Rhythm - Frequency to sustain trance.